So there’s a website I was introduced to when I decided to move ahead with my goal of writing romance. I’d written business books for a long time – almost a dozen of them – but romance was something new. Now I’m not someone who wants to write one novel, and that’s it. Nope. I dream big. Like Nora Roberts big. Like counting your books up by the dozens, by the hundreds. So of course, that means I’ll have to write at a pretty healthy pace. Enter The Smarter Artist. These three guys write at a breathtaking pace. Like 1.5 million words a year. Yep, I can deal with that. So, back to the website. I was directed towards a course. How To Plan and Outline Novels Using Scrivener. You already know Scrivener is my favorite tool of choice. So I took the course, and was fascinated by how much time they spend developing their characters and settings before they ever type out their first word of a story. Yep, it changed my approach. My first draft was with the editor. Casey and Jordi’s story had been told. But after I took the course, their lives expanded before my eyes. It gave them more life. I started seeing them in different ways. I saw them in detail before Destination Barcelona takes place. 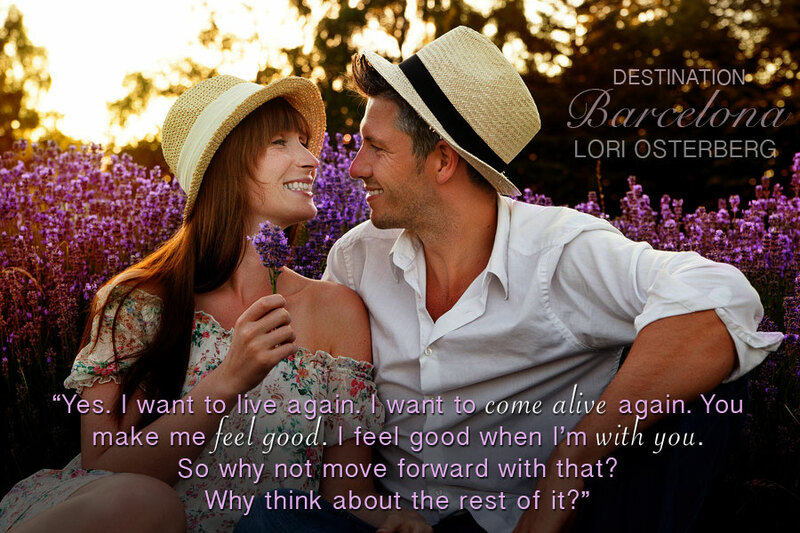 I thought it would be fun to “interview” them, and give you a little more history about who they are – outside of the story you’ll read in Destination Barcelona. Because whenever I read a book, I always finish it off by wondering about their “next” life. What happens beyond the pages? How would the author write their next phase? Here are a few extra things Casey and Jordi would want you to know. Q: How nervous are you about your next phase, an empty nester, now that your daughter has chosen a school twelve hundred miles from home? Casey: We’re very close, so this is going to be hard. For the both of us. But it’s a natural part of life. I’ve raised an independent daughter. I want what’s best for her. I want her to be all she can be. And in reality, I think her heading this far from home and being on her own will give her a chance to spread her wings and fly. I’m her mom. I have to whine a little. LOL. And of course, I’ll miss her desperately. She’s such a good kid; we have a very close relationship. But she is her own being. And I want her to be happy, successful. This is the next phase of our lives. Her and me. This is going to give time to figure out what’s next for me. I know that’s important, that I have to be a role model for my daughter. And that means finding out who I am, today. I want to be so busy with that, that I don’t have a chance to wallow in missing her. Q: You divorced after catching your husband with another woman. How do you currently feel about marriage and commitment? Casey: What made that whole process bad was catching him in a lie. I’d spent several years caring for his mom, my mom, and dad. Caregiving is hard, and I’ll be the first to tell you that I wasn’t always a happy person to be around. Watching all three of them sink, get sicker, dying, that was hard. Life-changing hard. But the fact that Rob didn’t understand that, didn’t support me more, that’s where our troubles began. He didn’t fall into a one-night stand because he was lonely. He’d been doing it for a very long time. He lied about where he was going. What he was doing. Trust was broken. And I’m way too strong to allow that in my life. But that doesn’t mean I don’t value commitment. Marriage, I’m not sure about. That’s a long ways off. But I loved being married, before. I loved being a part of a team. And I’m up for doing that again in my life. I’ve never thought much about it, but I’m not against it. Q: How important are the relationships in your life? Jordi: I knew from early on that traditional marriage wasn’t for me. Not what my mom and dad had, raising four kids in a house they stayed in for forty years. Not what my sister and two brothers have, each having a spouse and children. I didn’t want kids. I wanted the ease of being able to travel, change quickly, do things spur of the moment. But I’ve always been fiercely loyal to my family and friends. My sister’s kids are as close to me as if they were my children. I’ve taken them both for weeklong trips. They stay with me often on their breaks from school. My friends are important. We do things all the time. They’ve been in my life for years. I’ve had long-term girlfriends in my life. But when marriage comes into play, they’ve always wanted the “settle down and have kids” thing. I’m passed that. I don’t want that. But would I be happy with someone with the same goals I have today? Being free to travel extensively? Enjoy spur of the moment things? Definitely. I love having good conversations, familiarity of the people around me, and the intimacy that comes from stability. Did you enjoy this sneak peak into Casey and Jordi’s past?